Adequate nutritional control is difficult. Although there are several tools to control your plant's chemical environment - such as pH, EC and ORP - in the end the main interest we have is to control the composition of plant tissue and how this composition affects plant development and yields. One of our sharpest tools to achieve this is leaf tissue analysis which allows us to look at plant composition levels and figure out if anything is wrong with our plants. Today I want to talk about this powerful tool, why it is not so simple to use, how to use it and why it can be so important in helping you figure out what's wrong with your crops. The general model for nutrients and crop yields explains that plants will absorb nutrients till a point of maximum yield. 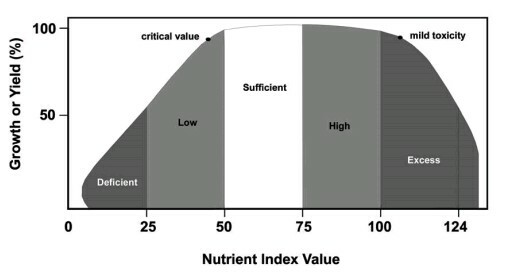 After this point increasing nutrients will not increase or decrease yields substantially for a while but after a given point toxicity will prevail and plant yields will decrease due to nutrient toxicities and potentially osmotic pressure issues. This model is simplistic as it leads to an overall linear understanding of plant nutrients which is why growers often find leaf tissue analysis puzzling and confusing. In leaf tissue analysis we most commonly obtain a sample from the plant's most recent mature leaves. This tissue is analyzed by a lab and we obtain a chart where the percentage composition of the plant tissue for the different elements is given. We can then look at reference values for healthy plants and if any of our nutrients are outside this range then there is certainly something wrong with our crop's nutrition. Sometimes the lab will also give you some reference values but bear in mind that this aren't necessarily healthy plants but the average of what the lab gets for the plant specie you are growing. You either want an academic/government reference for healthy sufficiency ranges or you want to grow healthy plants yourself and take a reference sample to use for your future crops. The tricky part is to interpret the tissue analysis. For example let's suppose that your tissue analysis comes up with low phosphorous. The immediate intuitive response that we get from the general model of nutrient sufficiency is that we should increase P in solution to get the P up within the leaves. However nutrient relationships are non-linear and in many cases what you have isn't a general lack of enough nutrient in solution but a problem getting that nutrient up to the leaves. In the case of P for example it might range from having excess chloride to having a nutrient solution that is too cold. I haven't seen a single case in hydroponics where low P in leaf tissue has actually been due to low P in the nutrient solution. It is important then to realize that a problem within leaves is not necessarily a problem with concentration for that specific nutrient being too low or high in solution - in my experience it rarely is - but more so a problem with the balance of nutrients in solution or the environment that is causing a nutrient absorption issue. There are all sorts of antagonic and synergistic relationships between the different nutrients and the environment that will make this hard to interpret in many cases. To know what might be the cause first you will want to address all environmental issues that are known to cause toxicities/deficiencies and then look into addressing nutrient issues relative to the solution. You will want to pay a lot of attention to ratios instead of absolute concentrations. You can have a perfectly good nutrient solution and the absorption problem might be related with something like transplant stress, root pathogens, incorrect carbon dioxide supplementation, light issues, temperature/humidity problems, etc. Growers tend to focus on the nutrient solution as the potential source and cure to all plant problems but the key is often in the environment and crop management more than within the actual nutrient solution. Even when the cause is the nutrient solution growers often misdiagnose the problem and increase or decrease nutrient concentrations, more often than not making the problem worse. Due to the above it is not surprising that few hydroponic growers find tissue analysis very useful. While in soil crops tissue analysis is usually used to manage fertilization and soil amendments in hydroponics the environment and solution are so controlled that the problems become much more difficult to diagnose and the solutions are often not what you would consider intuitive. It certainly requires a lot of reading and experience to properly interpret leaf tissue analysis and tackle the causal factors that are causing issues in hydroponic crops. However with enough experience or guidance leaf tissue analysis can be a great tool to know what your plant is taking, what it's not and how these issues can be fixed.